Abu Dhabi: Today she is the proud mother of 28-year-old Amr, but the director of the Emirates Autism Centre remembers clearly the shock of finding out that her youngest child had autism. “He was just two and a half years old, but I could tell he was different. Still, the diagnosis left me reeling. I had to pull myself together, and I knew I was in for a struggle. How would I educate my son? How could I give him as normal a life as possible?” Amel Sabry, 57, a resident from Egypt, told Gulf News. Her efforts meant that Amr eventually earned the distinction of becoming one of the first individuals in the UAE to graduate from a mainstream school. Seeing Amr’s challenges also prompted Sabry to establish the Centre in 2007, which now enrolls 50 individuals with autism spectrum disorder. child the best possible chances. “Living with a family member with autism is a learning experience every step of the way. In fact, life with Amr inspired both my other children to pursue careers in health care so that they could help others,” Sabry added. 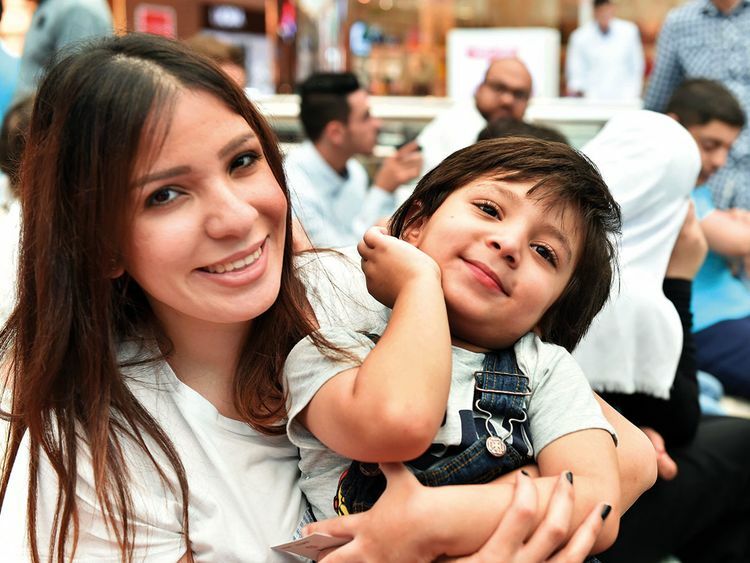 Sabry was speaking on the sidelines of an awareness event at the Mushrif Mall in Abu Dhabi on Tuesday, where families met to celebrate individuals with autism spectrum disorder. “Today, on World Autism Awareness Day, I want people to understand that every little bit of progress by an individual with autism is an achievement and a cause for celebration. And, as shocking as it may be to find out that your child has autism, it is important to intervene early to give your child the best possible chances,” said Sabry while addressing other parents with children on the spectrum. “I’ve had a long journey with my son. But today, he is well-adjusted, and works to help me at the centre,” she added. Parents at the awareness event said unequivocally that raising a child on the spectrum presents unique learning opportunities. “My three-year-old son was meeting all his developmental milestones. He had just begun to speak. Then suddenly, when he was about 18 months old, he just stopped speaking. He was diagnosed with autism, and I learnt that I had to be patient with him. I had never known then that I could be so patient,” said Nour Kaddoumi, a 28-year-old homemaker from Jordan. As she held on to her son, Mahmoud, Kaddoumi said she hoped to see a more inclusive world. “He is slowly learning to share his toys, and to verbalise and play with others. As he progresses, I hope he will also get opportunities to thrive,” said Kaddoumi. “After all, children with determination do help reveal our hidden strengths,” she added. Autism, or autism spectrum disorder (ASD), is a developmental disorder that is characterised by challenges with social skills, repetitive behaviours, speech and nonverbal communication. Its prevalence in the UAE is not known, although experts estimate that it affects one to two per cent of the overall population (of around 9.5 million). In the United States, one in every 59 children is on the spectrum. The disorder typically presents in early childhood. He is slowly learning to share his toys, to verbalise and play with others. As he progresses, I hope he will get opportunities to thrive. Because autism is a spectrum disorder, each person with autism has a distinct set of strengths and challenges. The ways in which people with autism learn, think and problem-solve can range from highly skilled to severely challenged. Some people with autism may therefore require significant support in their daily lives, while others may need less support and, in some cases, live entirely independently. After diagnosis, patients are treated with a combination of medication and cognitive and behavioural therapy. The therapies are designed to help individuals reduce unusual behaviours, learn life skills for independent living and learn social skills.